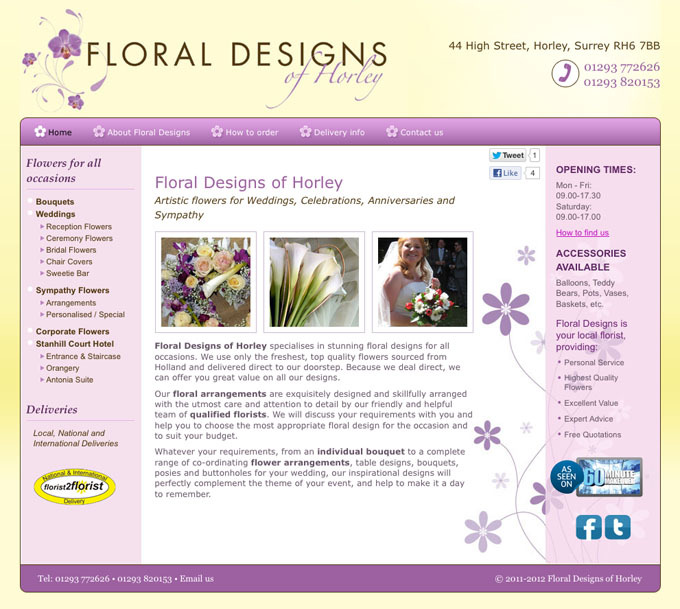 Floral Designs of Horley is a florist shop in Horley supplying floral arrangements including wedding flowers and funeral tributes. This is a redesigned website in more than one sense of the word. It's both a redesign of an original website for the owner, Petal's Florist site, which the owner sold after purchasing the Floral Designs business. That came with a fairly outdated website, so the material that was relevant from this site was combined with material from the original Petal's site. Printed photos were supplied for the gallery, which were all scanned in and combined with the earlier galleries. The client has since sold this business and the website discontinued.